approx. 7 x 10 inches. approx. 5.5 inches tall. 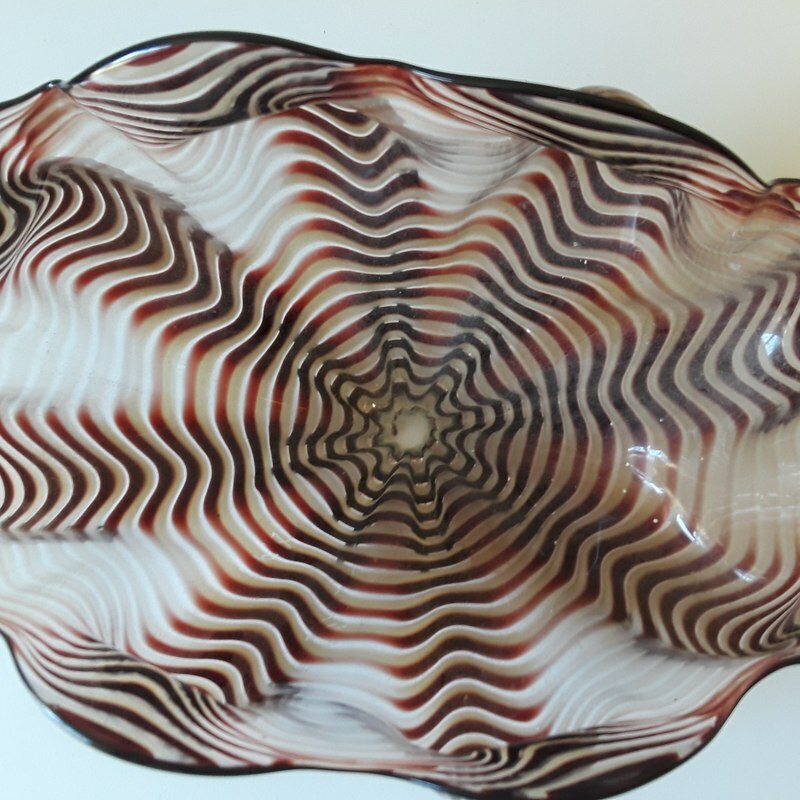 This is a vintage, 20th century, signed and dated 1997 hand blown studio art glass basket or bowl by renowned American glass artist Dale Chihuly (b. 1941) from Washington State. The glass 'basket' is done in a clear and brown, aka tabac, with striping in the glass and ruffle form. These are from the Seaform Persian Basket line by Chihuly. This particular color and style has been catalogued as 'striped zebra'. Usually seaforms consisted of various pieces to make a small sculptural grouping. The provenance, or history of ownership, is that this was a direct gift from the artist himself. Chihuly began working with glass in 1965 and studied under Harvey Littleton. By 1968 Chihuly earned his Masters of Fine Art from the esteemed Rhode Island School of Design and with a Louis Comfort Tiffany Foundation grant and a Fulbright Fellowship he apprenticed at Murano glass studios in Venice, Italy. In 1971, after his return to the US, he co-founded the Pilchuck Glass School near Stanwood, Washington. His works are displayed in Institutions throughout the world and widely collected. The estimate is based on actual recent past recorded auction sales of comparables. Retail 'asking prices' can be higher and vary.